Stack Rock Fort (Palmerston Folly). 1 of 11 forts built around the Haven in just 20 years 1850-1870. 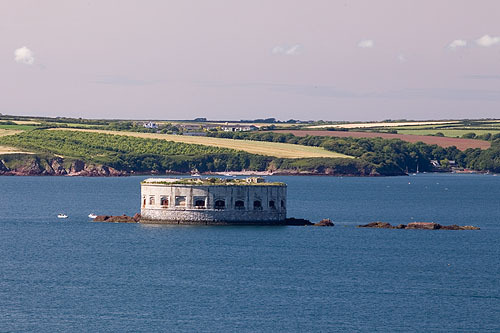 Perhaps the most striking of all the Haven forts / sitting remote on a mid-channel rock in the haven / originally a Cambridge Gun Tower / 1851 / similar to the Martello Towers of Pembroke Dock . Between 1859 and 1871 the present building was built / a circular casemated fort with 23 guns / which completely enveloped the former tower / accommodation for 180 men . Changes to the armaments over the life of the fort.